Since my bedroom makeover I've been trying to keep it neat, organized and always stocked with fresh flowers. There is just something calming about going to sleep and waking up next to some pretty blooms. It really does make that hideous alarm clock sound a smidge more tolerable. This week I have some fun pink and yellow dahlias next to my bed. They came from my good friends baby shower and remind me that a beautiful little girl will be here soon! The same items are almost always next to my bed. Maybe different versions of these items, but the same basic things are always close by. 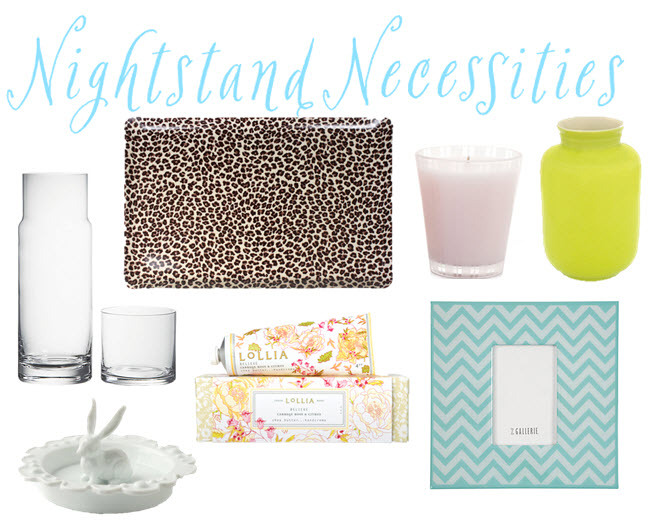 Tell me, what are your nightstand necessities? 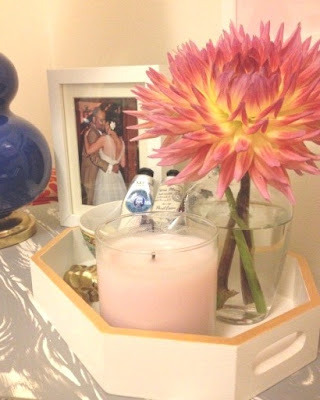 Posts like this make decorating easier and harder at the same time..easier because you took all the time and energy to put great finds out there...but harder because now I am thinking about what I need to buy to make my nightstand better;-) Love the color of that vase. Lets see besides a lamp and a tray I always like to display a little nature like rocks or shells etc. Hope all is well Linds. I am on the prowl for some chic nightstands, but I always have books, a candle, our wedding photo and our Tiffany alarm clock. (wedding present) and a lovely vintage lamp. I love your leopard tray! I always have to have my cellphone right next to me, because my addiction to it is bordering on unhealthy. Couldn't agree more. Love this must have list. Love me a good smelling candle. Absolutely agreed on the fresh flowers, the only way to start the day on a pretty note! While nightstand items are always on a bit of a rotation for me, a super hand creme is never far away, I will have to try out the Lollia one you featured! I have eye cream, water, my glasses, lamp, magazines, a little dish for my jewelry. What is Lollia Believe hand creme??? Is this something I should know about? I have moisturizer, glasses, remote,(yes I watch TV in bed!) lamp, water on my night stand. Books and mags stacked next too it. Would you believe I have some version of all of these items at my bedside? There's nothing like waking up to pretty surroundings. Couldn't agree more on the carafe. I have one next to my bed. Not only is it useful for those late night thirst attacks, it also looks really beautiful. And love the zigzag frame....I think I need to get myself one!